Fangirls, it’s here. 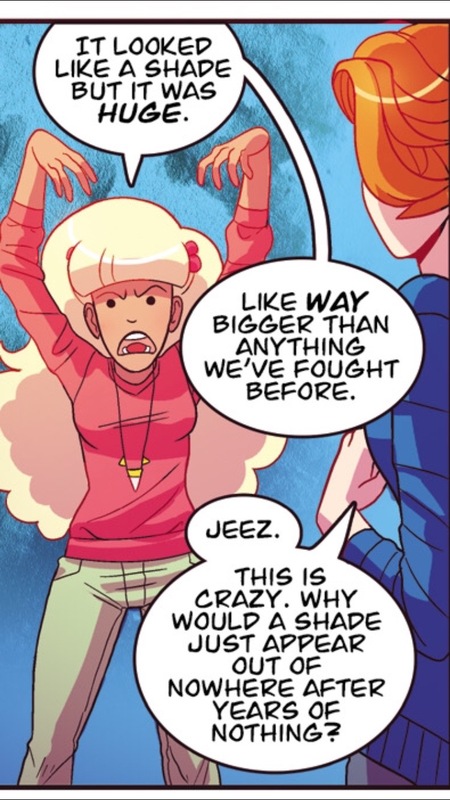 The comic I’ve been losing my mind over for the past couple of months, Zodiac Starforce, was released today. If you’ve been following my twitter, or instagram, or know me at all, you know that I’ve been in love with one character, Kim, since I saw her. I cosplay as her, obsess over her, all that jazz. Now I’ve been able to finally “meet” her, and it’s amazing. Warning: this contains first issue spoilers. You should go read the issue. From the left, around; Molly, Savanna (Savi), Kim, and Emma is the big one in the back. 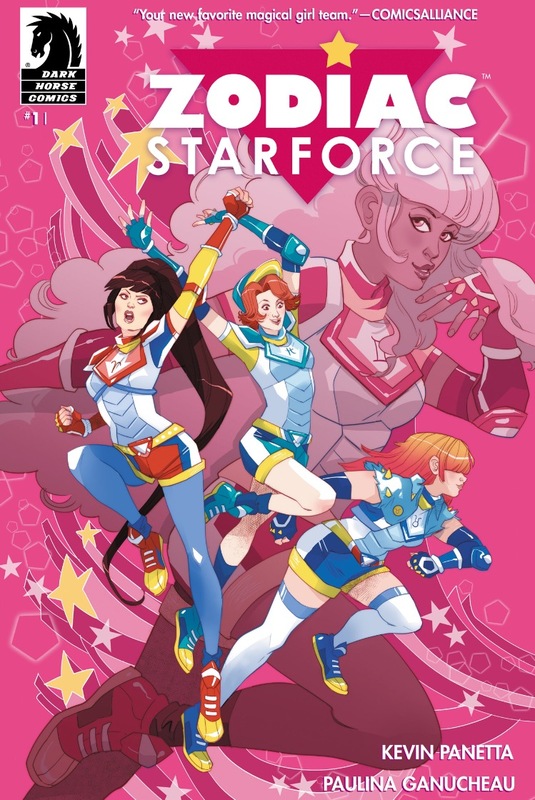 Zodiac Starforce is a magical girl comic published by Dark Horse Comics, written by Kevin Panetta, with art by Paulina Ganucheau. It used to be a webcomic, but Dark Horse picked it up for a four-issue run, and hopefully it will go past that. I almost stayed up until midnight to read it before I went to be, but I ended up falling asleep cuddling with my iPad. But when my cat woke me up at 5am, I downloaded it from the Dark Horse app, and read it. It was really hard not to be screaming with enthusiasm the whole time, but I did it, and hooooooly guacamole, it’s amazing. I had been working hard not to see to much about it; I read the character cards that Panetta and Ganucheau put on twitter, and I read interviews that were posted. Other than that, though, I wanted to be surprised. It was well worth the wait. 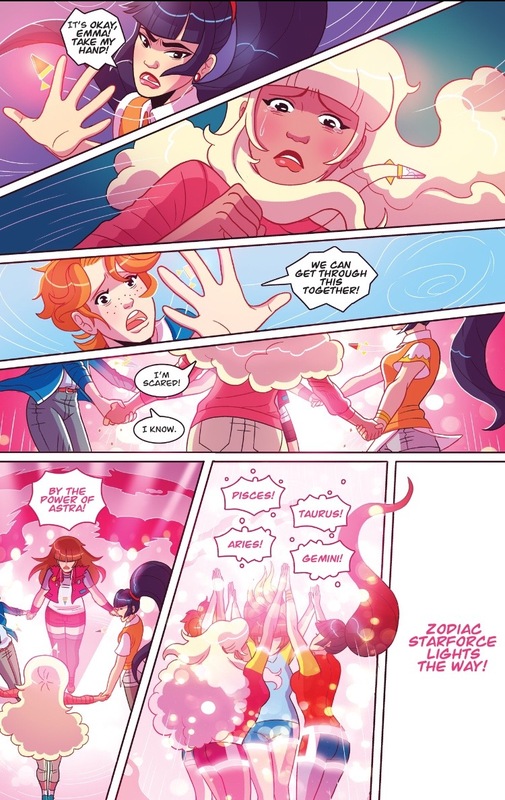 Zodiac Starforce focuses around a team of four high school girls who were given magical powers by a massive and beautiful being, Astra, several years ago. Two years ago, they defeated Cimmeria, and stopped their magic. But now, a monster has attacked their school, and it sets off a series of events that looks like they’re going to have to get the gang back together. Emma, the leader of ZS, is the one who fights the first monster, and then has visions of monsters at the party the girls tend that night, and even when they go see Astra. Though Kim is all about getting ZS back together, Emma wants nothing to do with that. Something happened to her mother when they were last together, and that pushes her from wanting to be her magical self, hopefully that will be expanded on. Though Molly and Emma are not into the idea of getting the group back together, Savanna and Kim are; Savanna wants to at least contact Astra. 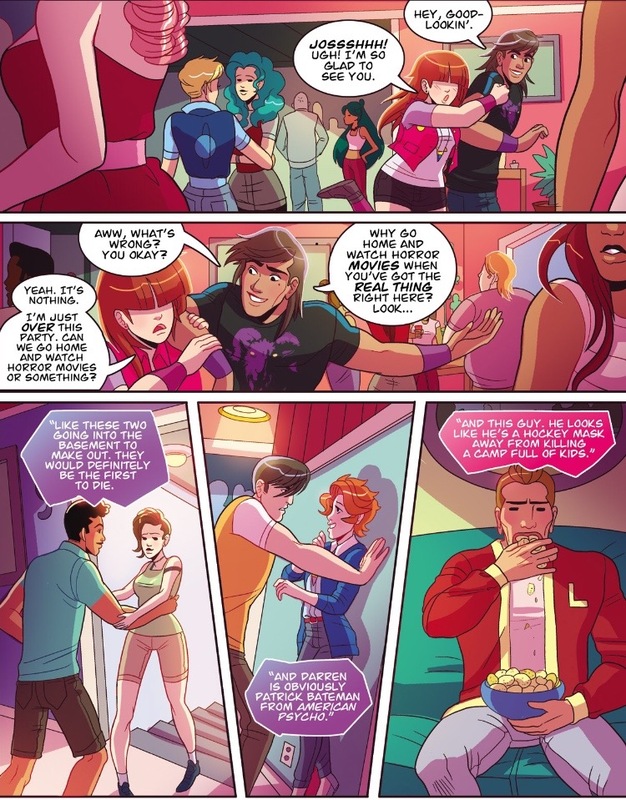 When they do, they find out that Cimmeria is trying to break back through to earth, and it’s going to be up to Zodiac Starforce to stop them. Friendship and magic, all a girl needs. Fangirls, I love them. I love the comic, I love the group’s dynamic, I love Panetta and Ganucheau, I love it all. I can’t wait to see how it continues, and I can’t wait to meet Panetta and Ganucheau at SPX next month. I highly recommend you grab this issue, and fall in love with these ladies the way I have. I was a little worried about the possibility of not liking Kim’s personality, but I love her. She’s great, the comic is great I love it, go read it!